Engineered for picture perfect presentations and all high-definition components such as DVD players, plasma displays and video projectors. Premium 100% shielding, high resolution coax, molded HD15 and star-cut RCA connectors provide maximum signal transfer. 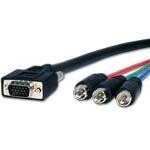 We have no downloads available for the Comprehensive Video High Resolution VGA to Component Cable 6 ft at this time.